You are here: Home / / 10 Things You Can Do With $1000 According To the 90210 “Rich Dad”. 10 Things You Can Do With $1000 According To the 90210 “Rich Dad”. 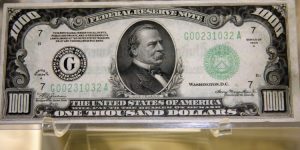 (ThyBlackMan.com) If you want to know what exactly you should do with $1000, here are ten tips to help you make a right decision. When people get money, they rush to buy stupid things or they simply keep it in their accounts. That way, they keep losing the money. If you want to do better things with $1000, here’s what you can do. The first and most important rule is not losing money. If you can’t afford to lose it, don’t give it to anyone and follow the safest way possible – a savings account. Think beyond your local banks and spend some time on research. Look for banks that offer higher interest rates on a regular savings account. You can also check other savings schemes, but be read the terms and conditions carefully. Keeping money in a savings account can not only help you earn from interest, you will always have the access to your money. Now when you have $1000 in hand, make the best use of that money. Do you have a burning desire to achieve or create something? Have you ever thought that if you could learn “that thing,” you would be making progress toward your life’s goal? This is the time to make things happen. Invest your money in learning things that can help you make tons of money. Invest in books, courses, or get the higher education you need. If you have any high-interest debts or if you use credit cards don’t invest your $1000. Anything you will invest your money in will hardly generate any significant amount of interest that the interest you pay on your debt. When you already have debt, instead of finding new ways to invest your money, come out of debt fast and then think about creating wealth. It’s totally understandable that you don’t want to let the money go away from you, but keep in mind that paying your debts down will take you closer to financial freedom and then you can freely start investing money. You have a business idea that could make money, not just for a few weeks or month, but for many years. You know very well that if you plan properly and implement well, your idea can do wonders. If it’s true then go for it. If you can’t establish a brick mortar store, try online businesses. If you have some good products, you can get an e-commerce website under $1000 and can invest the remaining amount in products and marketing. If you can find some cheap $1 – $5 products that can be sold online for more, you have enough money to start a store with the decent amount of stock. The benefits of homeownership often work as a key factor that drives first-time buyers but high down payments and maintenance costs can be major challenges. REIT or real estate investment trust is a type of investment that allows people to invest in real estate with as low as $500 and a small commitment. Unlike buying a physical real estate property that requires you to meet developers, agents, lawyers, and contractors, investing in REIT is as simple as buying stocks. If you only have this much money in hand, hiring a professional financial advisor may not be a good idea for some reasons. If this is the first time you’re hiring someone, you may end up seeking help from a wrong person. To avoid such problems, take help of someone you know who is good at wealth management. Do you have a friend who runs a business or knows about accounting? Do you know anyone in your family who knows and manages money a lot better than you? If you’re lucky enough to have a parent, sibling or spouse who is a better wealth manager than you, ask them to help you plan your financial journey and share the profits. No one takes the idea of building an emergency fund seriously when everything is going well. People think about it when they are in trouble or when they realize that their job isn’t stable. What would you do when your family members will be in need of help? Don’t think of emergency fund as an investment. It’s a safety net that can protect you when you will need nothing but money. The size of your emergency fund depends on your circumstances, but the more you put into it, the more peace of mind you can get. If spending $100 can make your life better and your productivity at work better, don’t hesitate in spending. You don’t have to invest all your money in one thing. If there are certain things that you can buy, for example, some software, gadgets or tools for the work you do in spare time, buy them. Even buying a bicycle or a car can help you a lot. It may sound contradictory because one needs fuel, maintenance, and insurance, but if it really helps you make or save more money, it is better you get one. Take your family on a holiday. In life, experiences matter a lot and traveling is one of the best ways one can earn countless experiences. Travel with a purpose and you won’t regret going to a new city and spending your money. You can consider attending an event that can help you become better not only as a professional but as a person. Experiences, memories and the joy of taking your loved ones to their dream place is beyond price tags. Now when everybody has the option to sell their insurance policy, investing in insurance can be the most important financial decisions. The security for your loved ones is the most important thing you get with an insurance policy. So, when you have the money, you should not waste the opportunity. Every night when you will go to bed, you will be assured that there’s enough security for your family.